Washington (CNN) - Few Americans know the name David Simas. But the White House political adviser has become the latest flashpoint in the continuing battles between the White House and House Oversight Committee Chairman Darrell Issa. Late last week, Simas was subpoenaed by Issa's committee to testify about his duties as the White House Director of Political Strategy. Issa is demanding to know whether Simas' activities are in violation of the Hatch Act, which bars most federal employees from engaging in partisan political activities. Before serving as Political Director for the White House, Simas was President Obama's point man in the fight over the Affordable Care Act. Before coming to the White House, Simas served as Director of Opinion Research for Obama's re-election campaign." "The Clinton White House, Bush White House, and other administrations before them have all faced congressional oversight of political activity supported by taxpayer funds," Issa wrote in a letter to White House Counsel Neil Eggleston Tuesday. "Under this Administration, like previous Administrations, members of President Obama's cabinet have committed violations of the Hatch Act, which draws a line between campaign and official business." Eggleston responded to Issa's subpoena by sending White House staffers to brief the Chairman's office about Simas' duties Tuesday. But a Democratic source complained to CNN that Issa was a "no show" for the meeting. "I do think it's fairly remarkable, that if Issa wants to be seen as genuinely caring about the issue (and not just cameras), that he didn't even bother to attend. I would love to know what his staff says he was doing instead," the source said. Issa's office responded by saying Simas did not attend the meeting either and pointed to a letter from the Chairman to Eggleston last week that stated the briefing was intended to be for the California Republican's staff. "The White House never should have had an expectation that members (of Congress) should attend, this was never planned as a member briefing. This is a fake issue they are trying to use to distract away from actual Hatch Act violations," Issa spokesman Frederick Hill said. Simas is still under subpoena to testify Wednesday, Issa said in a letter to Eggleston Tuesday. "The Committee has outstanding questions for Mr. Simas," Issa wrote in Tuesday's letter. "I believe his on-the-record testimony will provide valuable insight into White House efforts to ensure appropriate use of taxpayer funds." Issa noted House Democrats investigated the political activities of various White House officials in President George W. Bush's administration. Eggleston argued in his own letter to Issa that the Chairman's investigation threatens the separation of powers between the branches of government. The ranking Democrat on the Oversight committee, Rep. Elijah Cummings, D-MD, said Issa lacked any evidence to show Simas or his staff is in violation of the Hatch Act. "There seems to be no reason to continue this ridiculous confrontation other than to manufacture false controversy as Chairman Issa’s tenure comes to an end,” Cummings said in a statement. If the rabbit failed to emerge from the magicians top hat as his piece de resistance trick ISSA would sub poena the rabbit!! You know the one he has been trying to find ever since he's been shouting Benghazi, IRS etc and the rabbit ( responsibility he's searching for in the white house still has not turned up!! Sorry to say this car thief and corporate raider was my Congressman until they redistricted (thank God, except now we have Duncan Hunter who is almost as bad); he accomplished nothing for the people of his district, would provide no help, and spent all his time preening in front of the TV cameras – he hates Democrats and will do anything he can to embarrass or besmirch President Obama. Issa, Carson, Romney, Paul, Perry; is that the Republican Clown Car 2.0 I hear revving in the distance? Darrell Issa is nothing if not a loyal right-wing soldier, grimly doing his duty. Issa a Fraud, car thief and arsonist, total waste of tax payers money, some one get this clown out of congress. And good riddance, leave it to the gop to put a three time felon as an investigator, I guess they figured he thinks like a crook, because he is, arson, grand theft, twice, perfect guy to judge others. The hypocracy just never stops, get them out for crying out loud! "Under this Administration, like previous Administrations, members of President Obama's cabinet have committed violations of the Hatch Act, which draws a line between campaign and official business." This is typical Issa, declaring guilt and saying they have to investigate to see how guilty. He is still jealous he didn't get to head the special committee. 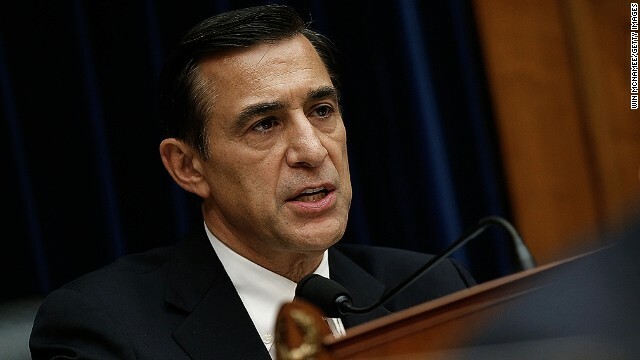 The ranking member of the committee says Issa has no evidence of any wrong doing so all this would be is a photo op fishing expedition, the man should be thrown out of congress for is continued waste of taxpayers money for personal ego gratification. Hey Darrell, I need a new car. Can you steal one for me? This regime has been totally in violation of using tax dollars for political purposes, every which way.......going and coming. Obama has been criminal in his own actions of using public funds to support his political activities. The only truth that I have ever heard come out of Issa's mouth was his promise to investigate the Obama administration to no end. We knew non-stop investigations were coming when Issa took over as the chairman. He promised us.